“Everyone has their own interpretation of creativity and what is meant by the word ‘creative’,” says Samantha McCoach, the founder of Le Kilt, a modern reworking of a family tradition, to i-D magazine recently. To McCoach creativity is about collaboration, listening to one another, continuing a family tradition and exploring new ways to further enhance it. Preservation is key: she works with many ancient Scottish mills, offering them a chance to produce her British-made output. There’s an overriding familial approach at play, and one can’t help but see potential in the endeavour. “I don’t necessarily believe that to save the world you need to be radically different,” stated McCoach. Her clothing isn’t groundbreaking: there are only so many times you can produce a new iteration of the kilt or materialise different add-ons. However, it does something which fashion has long forgotten, and that is to place emphasis on craft and shift the priority of style and substance to second and third place. Her work with Scottish mills, her attitude towards preserving family traditions display that this may be a business, but it also has heart. 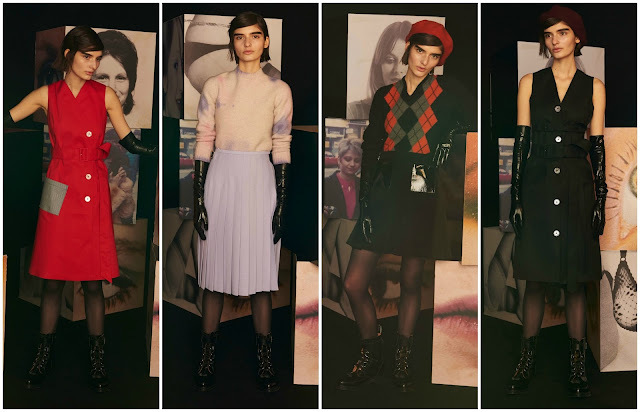 The heart of this collection was in 60s London. Perhaps she was attempting to revive the Swinging Sixties? It was a time of rapid change, the 1960s in England, much like it is now what with Brexit, an upcoming election, ever-changing social protocols. It’s an appropriate time to be drawing similarities with times of the past. A-line mini skirts, tartan kilts, double denim—it was a youthfully-inclined assemblage of modern styling tropes. The most intriguing looks were when McCoach placed latex layers atop her tartan kilt and accessories with black leather belt buckles—it was perverse, decidedly sexual and a departure from the spirit of her often chilly garments; it was a look imbued with the most emotion from her, it was also the most evocative. The only fault in McCoach’s work I can identify is her often prosaic perspective. There were inklings of a new direction in this show, presented at the BFC Presentation Space. She strives desperately to achieve timelessness with her garments, and it isn’t difficult. Her loyal customers will be more than satisfied with her kilts and they’ll surely continue to attract new customers… However, each collection is predominately comprised of pieces that fail to ignite a spark. The expansion of design vocabulary here and perverse expression signified change.